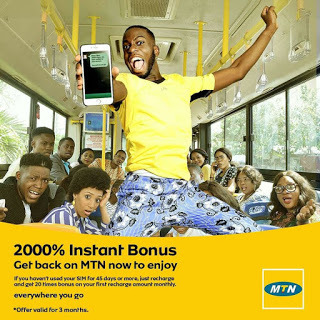 MTN Nigeria is back and better with an amazing welcome back offer for 2018, purposely designed for subscribers who haven’t used their line for at least 45 days. This offer gives 2000% bonus on recharges of N100 or more. This is a good move from the MTN to recover from the situation arising from a previous report, that MTN lost 11.5m subscribers. The welcome back bonus offer is expected to play a significant role in returning their old customers. *.N100 recharge will give you N2000 – N500 is allocated for calls and N1500 for data. *.N200 recharge will offer you N4000 – N1000 is allocated for calls and N3000 for data. *.N1000 will give you N20000 bonus – N3500 is for call and N16,500 for data. What Can the Bonus be Used For?? The money you recharged won't be touched as 500% of the bonus will be used for voice calls and SMS to all network in Nigeria and 1500% of the bonus will serve as data. EligibilityAll prepaid customers who have not used their MTN line in 45 – 180 days. Usage includes calls (incoming or outgoing), SMS (incoming or outgoing) or data. For this plan, national calls default tariff plan rate is 80kb/sec (N48/min), national SMS at the default tariff plan rate is N4/SMS capped at 75 SMS weekly and data at the default tariff plan rate is N5/MB. Please Note that you can get MTN 2000% bonus just once, and you can’t use the bonus to make data subscription.Remember,You will only Recieve the bonus on your first recharge in a month for the next 3months. Specifically, The bonus can be used for SMS, voice and Pay-as-you-go data bonus. To check the bonus, dial *559*65#.